You will be docked at the Minatocho Pier in Hakodate. Shuttle buses services are provided from the port to downtown Hakodate. The bus will drop you off at Town Planning center where maps will be handed out and any questions answered. In addition, the port is in the process of enhancing the Nishi wharf which will allow both locations to accept large ships. Construction is set to be complete later in 2018. The Nishi wharf is located right at the heart of the city giving visitors quick access. Hakodate Port was opened together with Yokohama and Nagasaki as Japan's first international trading ports in 1859. Facing out onto the Tsugaru Strait that divides Hokkaido and Honshu, it lies in an important position for shipping traffic, and was at the forefront of the modernization of Hokkaido. It plays a significant role in shipping with America, Canada and Russia via the Pacific Ocean. Take a trip to Mt. Hakodate, and on the drive be impressed by the agricultural area that feeds most of Japan, as well as, on arrival, the spectacular views. While there, try the Ropeway and then relax in one of the delightful Hot Springs, such as Yunkawa Onsen. Visit The Old Public Hall, an historic home, and don’t miss the remains of the famous western-styled fortress, with a 107 m tower and an art gallery, at Goryokaku Park . Hakodate's main ferry and cruise terminal is 4 km from the center and reachable on buses 1 and 19; a direct shuttle is also available between the ferry terminal and train station. If you are going to take the streetcar more than twice in one day, it is advisable to buy a one day pass from the driver when you get off (600 yen). You will get a free map of all the stops as well as many of the attractions. 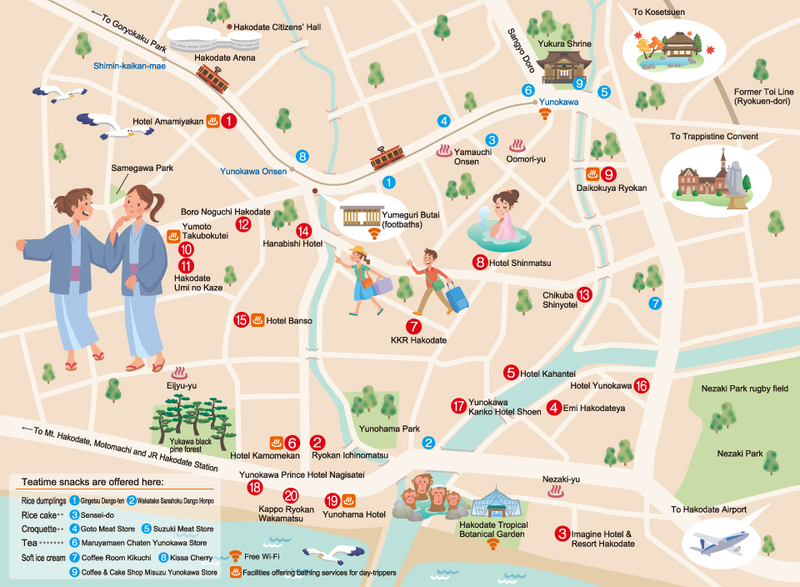 The Hakodate Guide Map is also provided free of charge at both the JR Tourist Information Counter and in the Museum of Photographic History's Tourist Information located in front of the Old Public Hall of Hakodate Ward. Tramcars come once per 10 minutes on each route, or once per 5 minutes in the section between Yunokawa and Jujigai, where 2 routes run on the same lines. Cars come once per 20 minutes (10 minutes in the above section) after 7 p.m.
Take the "Ropeway" (cable car) to the top of Hakodate Mountain A round trip ticket costs about $13.50 US. The views are spectacular. A half hour trip will take you to Onuma Park a delightful National Park with beautiful island-dotted lakes. Visit the "Morning Market" with plenty of foodstuffs and crafts. About a 20 minute walk from the shuttle drop-off.